Hello all, today’s post is also a review of another recipe. 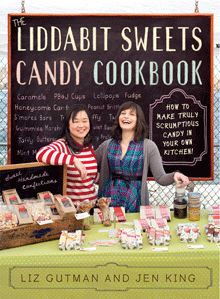 I don’t know how many of you out there have heard of LiddaBit Sweets, but you’re about to find out; it’s a cute artisanal candy company based in Brooklyn, NY (like all hipster-esque companies nowadays) and they have the most original and delicious recipes. I first saw them on the Cooking Channel show Food Crafters and then again on the show Unique Sweets. On Food Crafters they made their Smore’s Candy Bar and for nearly a year I tried to replicate it without avail. Finally I found out that they were coming out with a cookbook with all their recipes from their online store and so many more; I got it for Christmas from my amazing mother two years ago and I have yet to make every single thing in the book as there are enough recipes there to keep you busy for some time, but I have made a good amount of the things in there. 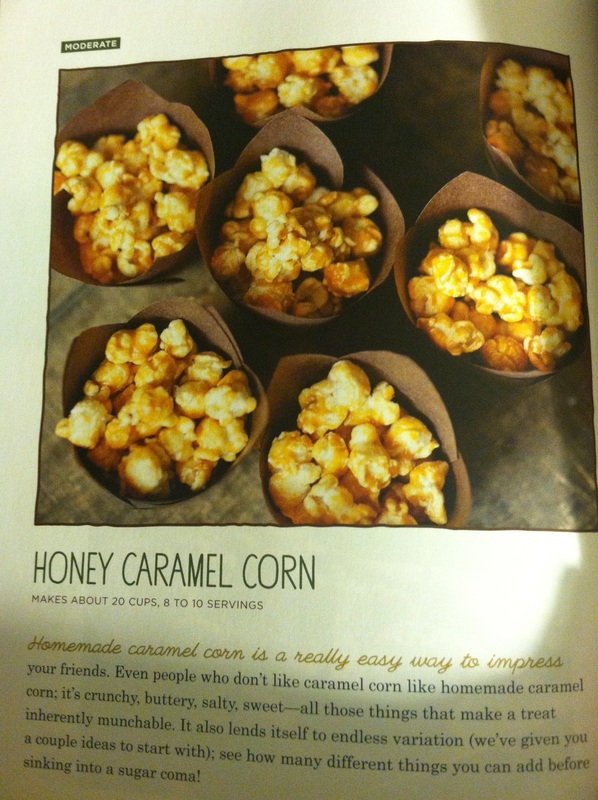 Of course I started with the smore’s recipe and it was a hit, I made it my own with some ingredient changes, but we’re not going to talk about that; today we’re going to talk about their recipe on page 228 Honey Caramel Corn. 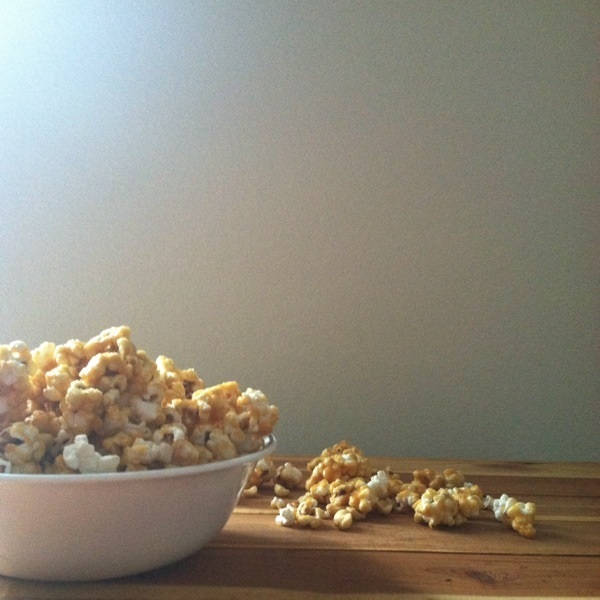 Behind the Scenes (BTS) : When first trying out this recipes there were some things I was hesitant about, the mixing process, the temperature and the popcorn popping without burning since I never made homemade popcorn before. I seriously encourage you to measure out all ingredients first before starting this recipe. The entire process happens very quickly and you don’t want to risk anything by taking too much time to measure something out. 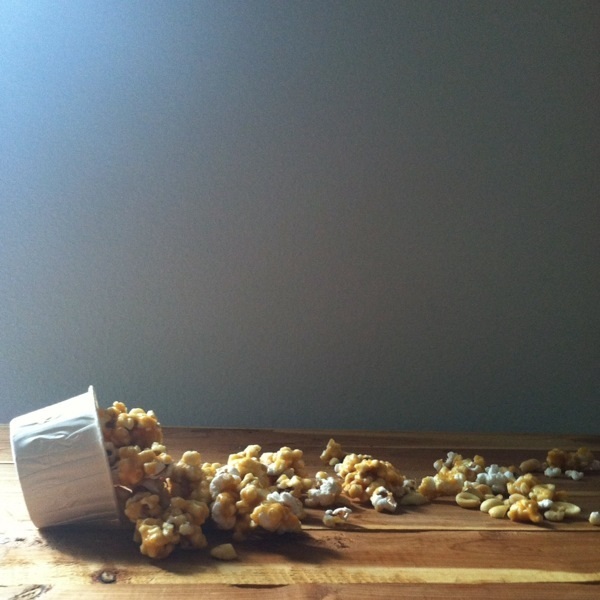 Taste: The taste of the caramel corn is outstanding, you can clearly tell that chefs who went to culinary school and learned through experience and trial and error created this recipe; it’s really an evolved flavor and more for the adult palate with the honey. Level of Difficulty: Like I stated earlier, if your measure out everything it will go smoothly. While this looks difficult Liddabit Sweets gave great step by step directions and suggestions to make this easy for the common man. As a whole, the entire process you would think is time consuming and a all day process, this couldn’t be further from the truth, it’s really quick and as long as your prepped before you start the actual cooking process everything goes smoothly. Helpful Hints and Suggestions: Besides, and yes I will continue to harp on it, measuring everything out ahead of time, I would say spray everything your are going to use with cooking spray (butter or canola). I also suggest getting a good candy themometer, I got mine at Target for $10 USD and I’ve seen it at Wal-Mart for a bit cheaper. Here is a link to both websites if you would like to see what they look like ahead of time. Here for Target and Here for Wal-Mart along with a guide on how to buy the right thermometers for you. 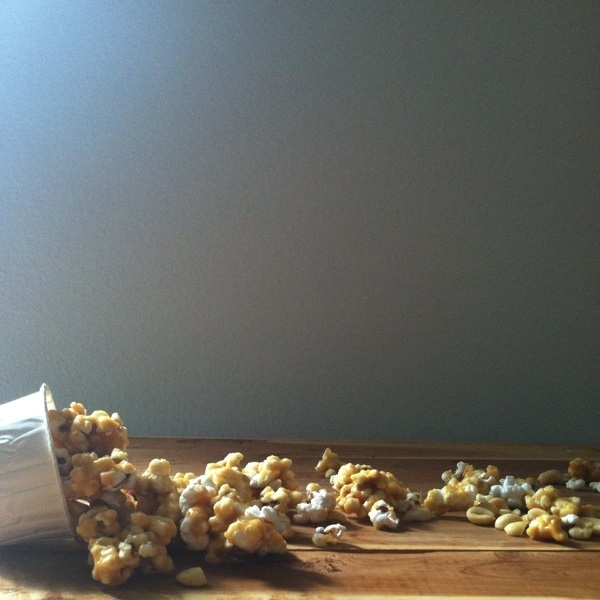 Another suggestion I have is to put the baking soda in right before your going to pour it over the popcorn, it boils up quickly and actually starts to firm up while it’s bubbling and you don’t want to take too long to pour it as it becomes harder to mix. My last suggestion is to actually not do this in a bowl. 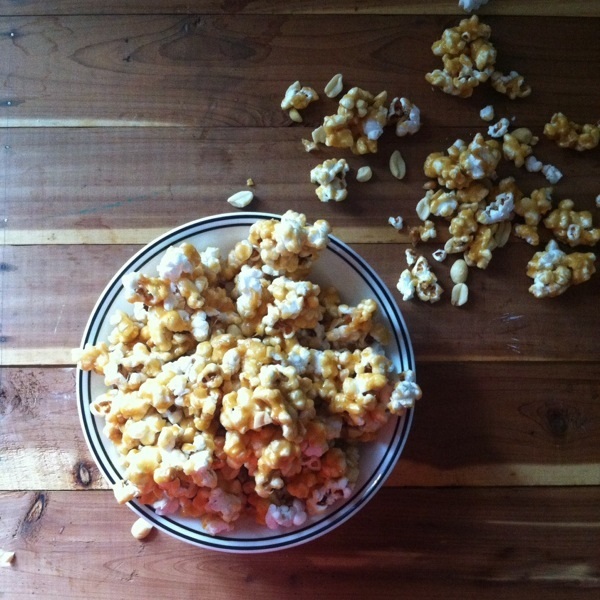 I’ve tried this recipe tons of times and I find doing it on greased aluminum foil, parchment paper (spray those surfaces as well) or for the best results silicon sheet and on a flat surface like a table or counter-top is easier; it gives you more room to move and makes escaping popcorn less likely. Adjustments: I only made a few adjustments to the recipe as I continued making this. I took the caramel off the stove at 280 – 290F rather than 300F. 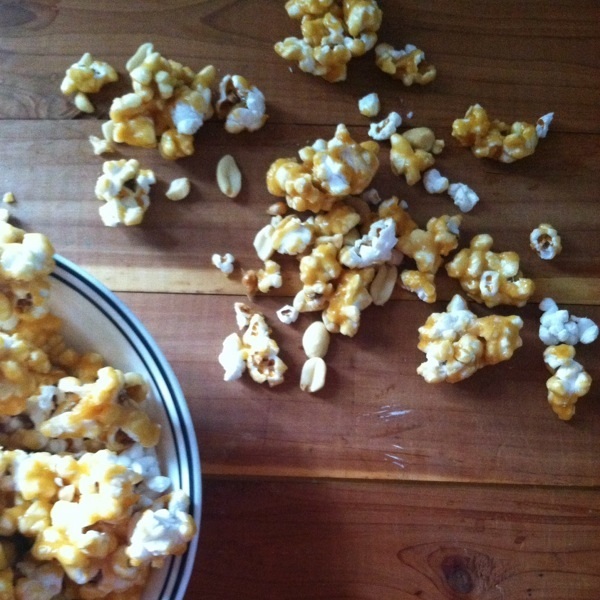 It made things easier when it was time to mix it with the popcorn. I also replace nearly all of the corn syrup with honey and left only about 3 tablespoons of corn syrup from the original in my version; I really don’t like corn syrup in my sweets, I don’t like the sweetness or what it’s made out of; too many preservatives. I also added peanuts to the recipe, about 1 cup (120 grams). I like the added texture it gives to the recipe, if you want another alternative to the peanuts is adding almonds instead and drizzle dark chocolate over the cooled caramel corn for a more adult treat. Overall Review: Overall I love this recipe, just like I love all of Liddabit Sweets recipes. They truly take traditional sweets and give them a nice little adult upgraded twist. I encourgae you to make this recipe and would give it 4 stars if I was qualified, but since I don’t work as a New York Times food critic and I’m just here sitting on my bed typing this up when I should be doing Finance homework, I guess I’ll just encourage you to buy the book and see for yourself. The recipe below is the recipe from the book. There are so many recipes in this book of treats ranging from this all the way to candy bars, cookies, jellies and so on. They also tell you great hints, suggestions, and information about the process of baking and the whys behind it; it’s truly like the beginners guide to making your pastry kitchen your female dog. The link to buy this book (which you should) is here, here, and here and the link for this website in case you want to check out their stuff, which you also should and order a few as well, is here. Ta-Ta For Now: I hope you guys don’t just read this recipe but give it a try. A lot easier than it looks. ENJOY! The first thing everyone should do is get their ingredients measured, separated, and ready to go. It makes it much harder if you measure these things right before you’re supposed to combine the ingredients. Lightly coat the mixing bowl, measuring cups, items that pre measured honey and corn syrup will be stored in, and the heatproof spatulas with cooking spray. Now, pop the popcorn. It will take 5-7 minutes and can be done in smaller batches if being done in a microwave. After this, the real technical work begins. 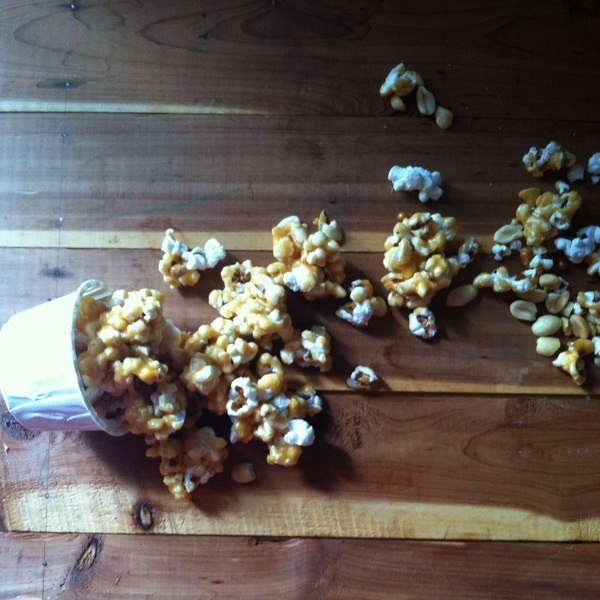 Place the popped popcorn in the bowl and set it aside. Remove the caramel mixture from the heat, add the baking soda and peanuts, and stir thoroughly. Careful: this will cause the mixture to foam slightly. 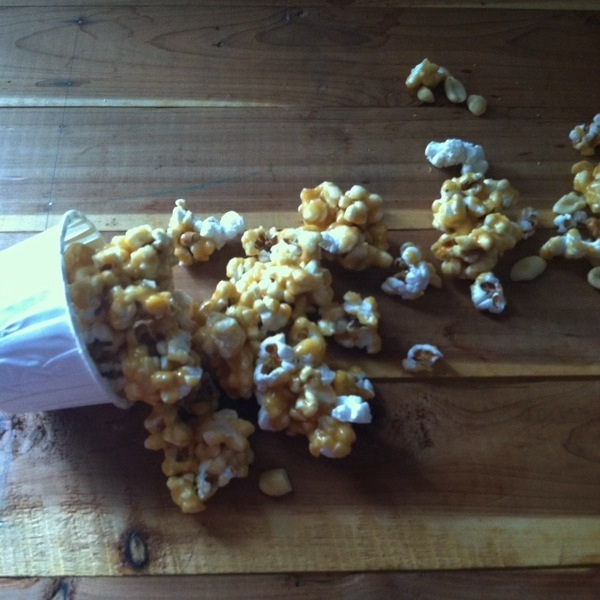 Immediately store the popcorn in an airtight container or zip-top plastic bag; it will keep at room temperature for up to 1 week.